Team Epiphany intends to build a 20’ diameter XM research lab modeled after the Globe of Science and Innovation at CERN. Within the replica, a series of Physics and Ingress-themed escape room puzzles will be hosted. Each puzzle will reveal a piece of the story explaining what happened leading up to the night of the second XM explosion at CERN. Solving all the puzzles will reveal the entire story. As in December 2012, key researchers were lost along with intimate knowledge of the events which triggered the accident, but surviving XM researchers will be on hand to assist Agents as they attempt to uncover the truth. The main structure will be a dome constructed out of 165 pieces of stainless steel tubing attached using nuts and bolts at 61 vertices. Each strut for the dome will be less than 5’ in length, allowing for easy transport in any vehicle. Other laboratory furniture, equipment and materials will be on hand to assist with Agents’ research attempts. 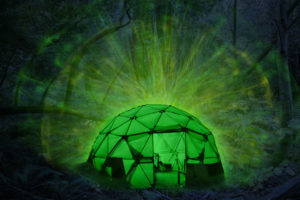 The laboratory will be integrated with existing Techthulu technology as a warning system to herald the possibility of another XM cataclysm or spontaneous XM Portal eruption.